Russian Video: The Diamond Arm (Movie)! This weekend we continue watching movies by Leonid Gaidai Russian outstanding director of comedy-movies. 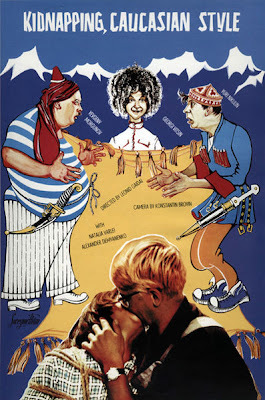 The Diamond Arm was made in 1968, directed by slapstick director Leonid Gaidai and starred several famous Soviet actors, including Yuri Nikulin, Andrei Mironov, Anatoli Papanov, Nonna Mordyukova and Svetlana Svetlichnaya. The Diamond Arm has become a Russian cult film. It was also one of the all-time leaders at the Soviet box office with over 76,700,000 theatre admissions in the Soviet era. To watch movies directed by Leonid Gaidai on Russian Video from Russia click: Leonid Gaidai movies. This entry was posted in Gaidai, Movie for the weekend on March 20, 2010 by admin. Russian Video: Ivan Vasilievich Changes Occupation (Movie)! Who is Ivan Vasilievich and why does he change occupation and what is so unusual in the changing occupation thing? You answer these questions if you know that Ivan Vasilievich is Russian Tsar Ivan IV (Ivan the Terrible) 1530-1584 and he has to change his occupation because… he accidentally got to Soviet Russia by Time Machine. If Ivan Vasilievich (Ivan the Terrible) liked it here and how to survive in the middle of 16th century even if you are tsar you’ll find out by watching this comedy based on a play by Mikhail Bulgakov. 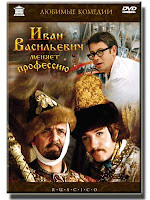 Ivan Vasilievich changes occupation (Иван Васильевич меняет профессию) was made by upstanding Russian movie director Leonid Gaidai (our regular readers already watched several his movies) in 1973. Composer Aleksandr Zatsepin and lyrics for songs wrote Leonid Derbenev. In this movie we will meet again the same Shurik whom we like from movie “Kidnapping Caucasian Style (Shurik’s New Adventures)” So we highly recommend you to watch the video! More about the movie Ivan Vasilievich changes occupation you’ll find in Wikipedia. This entry was posted in Gaidai, Movie for the weekend on September 19, 2009 by admin. Russian Video: Operation Y and Other Shurik's Adventures (Movie)! As usual at weekends we watch full-length Soviet/Russian movies with English subtitles. 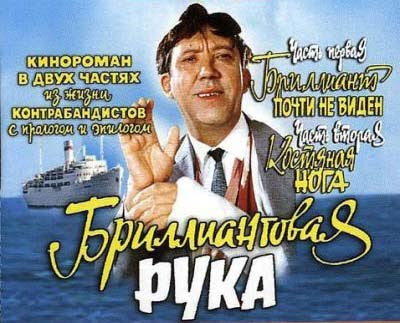 This weekend we are watching an old (made 1965) Russian comedy “Operation Y and Other Shurik’s Adventures” (Операция Ы и Другие приключения Шурика). The movie was made by outstanding Russian film director Leonid Gaidai. That was his third movie. We already watched: “Strictly Business” (Деловые люди) and Dog Barbos and Unusual Cross. Bootleggers (Пес Барбос и необыкновенный кросс). 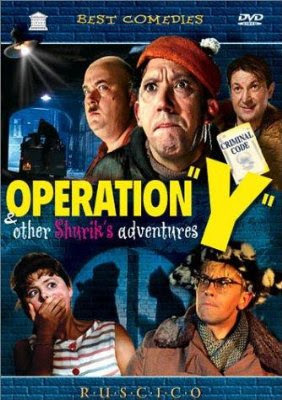 “Operation Y and Other Shurik’s Adventures” сonsists of 3 independent parts: ‘Workmate’ (Напарник), ‘Delusion’ (Наваждение) and ‘Operation Y’ (Операция «Ы»). This time we’ll get know another Gaidai’s favorite character Shurik: some serious student, he wears glasses and looks like nerd but he…. Let’s better watch! And yes we’ll meet again our favorite personages: comic trio of crooks Experienced, Coward and Fool. And Shurik we’ll meet them too (in one of the novels). This entry was posted in Gaidai, Movie for the weekend on July 12, 2009 by admin. Our regular readers already know the name of outstanding Russian comedy-movie director Leonid Gaidai (1923–1993). We already watched his remarkable screen version of O. Henry’s stories “The Roads We Take”, “Makes the Whole World Kin” and “The Ransom of Red Chief” – Strictly Business (Деловые люди), 1962. What we like very much! This entry was posted in Gaidai, Movie for the weekend on April 18, 2009 by admin. Russian video: Strictly Business (Деловые люди)! Our regular readers already know that we are watching full-time Soviet or Russian movies with English subtitles on Russian Video from Russia at weekends. Today we start getting know an outstanding Soviet movie director Leonid Gaidai and his favorite great actors Yuri Nikulin, Georgy Vitsin, Rostislav Plyatt. We’ll watch a movie “Strictly Business” (Деловые люди), Mosfilm, 1962. Best screen version of O.Henry. The film has three parts, each of them a screen version of “The Roads We Take“, “Makes the Whole World Kin” and “The Ransom of Red Chief“. Lets watch “Strictly Business” with English subtitles. Writers: Leonid Gaidai (writer), O. Henry (stories). Release Date: 1962 (Soviet Union). Part 1. The Roads We Take (Дороги, которые мы выбираем). Part 2. Makes the Whole World Kin (Родственные души). Part 3. The Ransom of Red Chief (Вождь краснокожих). Hope you enjoyed this movie as much as we did! This entry was posted in Gaidai, Movie for the weekend on November 22, 2008 by admin.